Treat your child to a Birthday Party that they won’t forget as they enjoy some wholesome, outdoor fun with their friends. Your kids are assured to have a great time on this afternoon’s entertainment and will fall in love with our fantastic team of ponies. 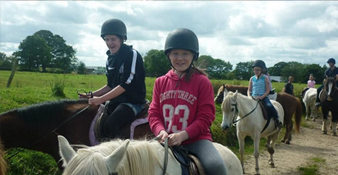 Get kitted out with our hats and boots and meet our horses before mounting up for a short lesson and an adventure out through the fields and hills around the farm. Finish off back in the arena with some trotting, guaranteed to entertain and have everyone smiling. 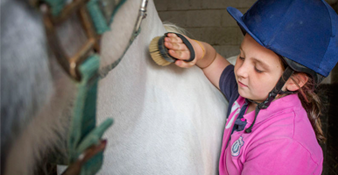 Learn to groom, tack up and care for your horse before heading out on a trek around the farm. 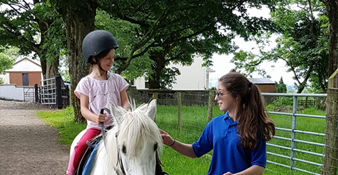 Finish off in the arena by learning to trot and then enjoy some games on horseback These games are suitable for total beginners and are make for a brilliant, fun-filled afternoon of bonding, both with horses and friends.